Michael and Natasha Masiuk with their Selfie Station in their New Canaan home. NEW CANAAN — Michael and Natasha Masiuk booked their tickets for Super Bowl 2016 with the hopes of watching their team, the New England Patriots, play. That didn’t happen — the Patriots didn’t make it to the Super Bowl — but the couple didn’t leave San Francisco defeated. 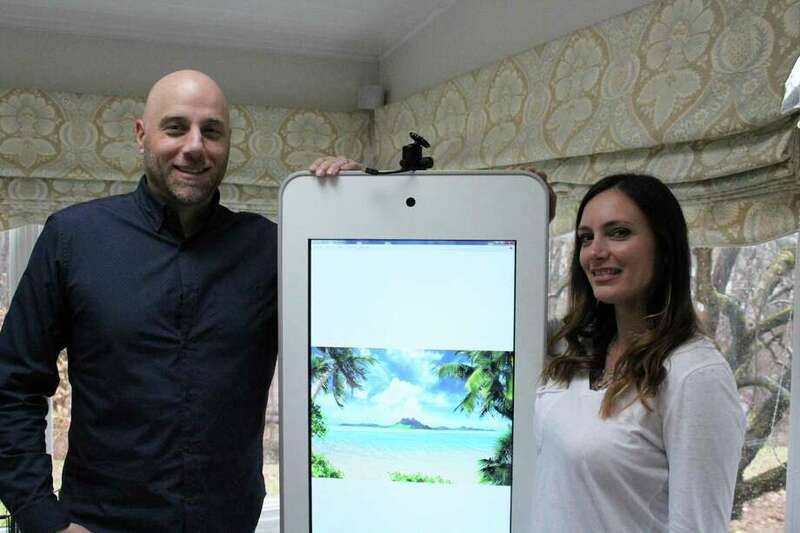 That led the Masiuks to Selfie Station, the San Diego-based company that rents and sells the photo booth that looks like a grossly enlarged white iPhone (“the iPhone 20,” Michael said, smiling). The models range from $10,995 to $13,955 depending on the packages. Natasha noticed how popular the booths were, particularly at weddings, and soon enough the couple decided to take their shot. “We didn’t really know much about the business, but we wanted to give it a try and so we bought just one,” Natasha said. Natasha admitted she and Michael are “not photographers” but their desire to learn and engage with the technology encouraged them. The couple first started donating the selfie station to local groups like their daughter’s equestrian club, New Canaan Mounted Troop. Through recommendations, the Masiuk’s selfie station began to get around to Greenwich and Westport. “Support in New Canaan and Greenwich has been phenomenal and people are happy to refer us. Word of mouth caught quickly and we’ve been lucky that way,” Michael said. The first time they leased their station was for a summer party hosted by Michael’s work friend. So far, the part-time gig has been better than the couple expected. When not hauling their selfie station around, Michael spends his days working at a hedge fund and Natasha is a medical device salesperson. “We’re kind of a mom-and-pop shop and our business has been referred mostly through word of mouth,” Natasha said. One of their big breaks was at the July 2016 Stamford Alive at Five concert series, only a month into the business. With the ever-present factor of social media, the selfie station tailors specific events for advertisement. The Masiuks offer a magnetic strip with the company or brand’s logo to attach to the booth. The photos taken by the station can include logos and can be sent immediately to social media websites, printed or sent to cellphones via text message. Given the success of their almost two-year stint, the couple has incorporated additional services to their business that include a DJ and games. “Music can either break or make your party and people were asking if we could supply that,” Natasha said. According to Michael, the busiest of seasons are around the summer and the winter holidays.